For how long shall we continue to fall by the abominable swords of the infidels? 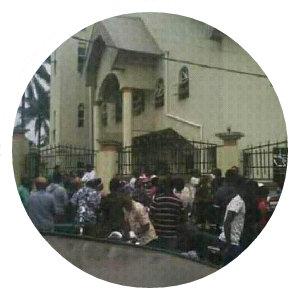 In the early hours of Sunday the 6th day of August 2017, some Hausa Fulani sophisticatedly armed men stormed St Phillips Catholic Church in Ozubulu of Anambra State and opened fire on the innocent unarmed worshippers. This terroristic attack amounted to casualties, claiming about 15 lives and leaving many others brutally injured. It would be nice if we can recall that this tactical means of killing occurred some days after the anti-Biafran genocidal song was circulated in the northern Islamic part of the zoo Nigeria. The song encouraged the killing of the people of Biafra in both northern parts of the zoo and in Biafra land. This is not the first time Biafran people have been killed by the northerners who are core radical Islamists, with the sense and imagination of viewing Biafrans as infidels who are not worthy to live. To be realistic, the killing of Biafrans is as old as the zoo called Nigeria. These beasts have continued to kill us because, we for whatsoever our reasons may be, have refused to arm and defend ourselves. We submitted to the defense of the government officials and parastatals who are slaves to the Fulani emirates. We submitted to the defense of those who have sold their people out for selfish interests coupled with hypocrisy. Biafrans, how long shall you continue to fall by the sword of these monsters? How many of your people will be slaughtered before you arise to defend yourselves? How much blood of our people will flow before we do the needful? What exactly are we scared of that amputated our hands and rendered us inactive to react when our people are killed? The time has come for all sons and daughters of Biafra to arise and fight against those who have vowed to Ethnically wash us off, the time has come for Biafrans to do the needful, we must come out massively to rescue ourselves and not wait for anyone to come to our aid. We must not wait for the killings to get to our doorsteps before we do the needful. Arise o Biafrans.